In this review, we will take an in-depth look at the Profit Legacy system and examine if, in fact, it does live up to all the claims it makes. We were particularly interested in knowing if it will help us make money or leave us high and dry like a lot of the scams out there. So, let’s dive into this review. At first glance and based on our initial impressions of the website we can tell you that this is not what it says it is i.e. a free binary options trading system. We have seen dozens of systems launching as of late with most of them following the same theme. The website seems no different than the others, unfortunately. After watching the promotional video on the homepage for a few minutes, our suspicions were soon confirmed. Anyone who has read many of the other reviews we have written over the years already knows that we are not fans of so called free binary options trading software. Out of the hundreds, we have literally reviewed on this website none; not a single one had shown positive results. As a matter of fact, the vast majority of these systems have left traders with far less money than what they started with in the first place. So, the question is, is Profit Legacy any different? We are hoping that this is the case, but we’re not getting our hopes up just yet. The video starts with showing various news clips, mentioning a number of statics mainly outlining the number of people working from home. Though it’s possible to make money working from home via jobs like internet marketing, but trading binary options is a whole different story. The video abruptly then says that you have been chosen at random to watch a special video which if you continue watching will help you generate at least $5,680 and up to $18,950 a day, without having any trading experience. Yes! These are tall claims but do they really hold any water or are they just a bunch of lies? The person narrating the video claims that there is proof which can be found if he logs into his bank account to show people how much he is making. So, in the video he does log-in, and shows everyone his ridiculously high balance of $1,831,030.64 but if anything this is not convincing evidence. Profit Legacy is for all intents and purposes is trying to sell you nothing but a dream something that many similar systems try to do because the system itself does not work. The video proof on the website follows a very similar pattern to many other systems we have reviewed in the past. It is for this reason that we are very skeptical about it, mainly because the bank account video can be doctored. But at the end of the day, people lose a lot of money as a result of falling for these scams. The creator of the software claims that he used to work as something called a ”trading network engineer,” and during his time was able to locate a couple of loopholes in the system. The claim is that the loopholes are legit but guarantee winning trades. Now let’s consider this statement for a moment. If that was really the case and there was guaranteed wins using the system the all brokers would soon be shuttered. You’d also hear about Profit Legacy on the news. Despite having doubts about the system we still had to review it and the review would be incomplete without examining the members’ area. So, we entered our name and email address to get access. Once in the members’ area, we were confronted with yet another video explaining how this was just the first step towards getting the so called free software that would change our lives. So, to get access we had to answer a question. The question was something like how much we wanted to make every month with the Profit Legacy system. It was a multiple choice question with options like $50k, $500k and $200k. All of these amounts are obviously insane. Seeing as we could choose any amount we chose the largest one i.e. $500k, and we are sure that anyone would do that. We were then taken to yet another signup page, with a form which asked for our phone number and after that to the system. Though before we could start using the system we were asked to make a deposit at a broker called Big Option. We think it’s positive that the website actually had a system in place which can be used. Though whether the system really works is an entirely different matter, but apparently there is one nevertheless. The reason why we think this is positive is because many websites claim to give you access to a system, but they never do until you make a deposit with their broker. But even after depositing the money with the broker you find out that there is no system in place. So, it’s all a big sham to trick people into giving up good money and also grab a sizable commission. The downside of all this is that despite it claiming to be a free system that we can use to make money, it asks us to invest some real money first. The amount is also pretty significant. After we had clicked on the ’deposit’ button, it had $400 filled in the box by default. So, we assume that this is the amount required to start using the system. Which apparently means it’s not free. 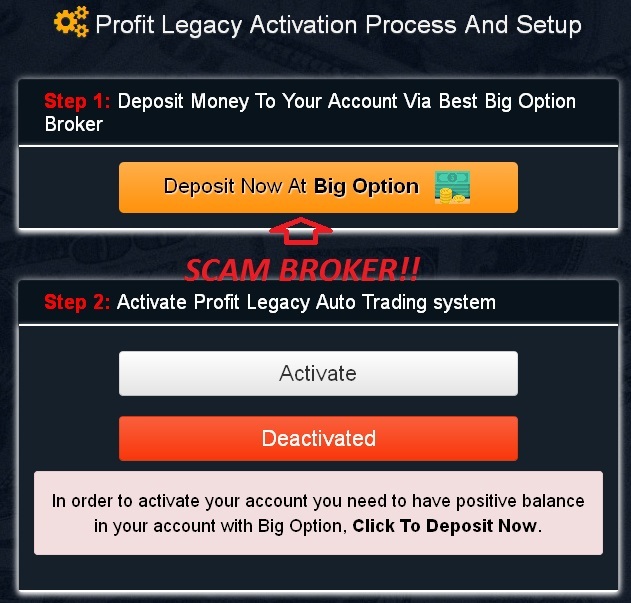 We will not recommend this system to anyone based mainly on the fact that it is a lot like many of the other free binary trading systems out there. Many of which we have reviewed, and they resulted in financial losses of those who used them. Personally, we reckon that if you decide to invest money in the system, there is a good chance that you will lose it. Binary options trading is like any other form of trading i.e. there are wins and losses.